The Vegas Golden Knights may have pulled off the impossible, but the Washington Capitals accomplished the incredible. 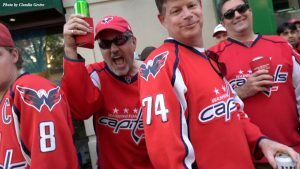 Like most years the Caps entered the Stanley Cup Playoffs picked to make it to the second round and then, like years before, exit the NHL postseason. But then they changed up the script a little. The Caps didn’t go quietly into that good night in the playoffs. They did give their fans some cardiac arresting moments, finishing every series — including the Stanley Cup final — on the road and often with their backs against the wall. Remember that scene in Star Wars when the trash compactor is closing in on the intrepid warriors? “There’s only so much drama we can take!” could be heard around the DC area. Against the Blue Jackets they lost the first two games at home, for crissakes. Four of the games in that series were decided in overtime. One playoff win at home against Columbus, and then it was off to Ohio for Game 6. Contrary to popular myth, Caps goalie Braden Holtby was up to the task in these playoffs. In that deciding game, which Washington won 6-3, Holtby had a save percentage of .921. He made such spectacular saves he was the game’s most valuable player. Then it was the reigning champion Pittsburgh Penguins. Holy crimany. The Capitals’ arch nemesis. They won that series on the road — as usually it would turn out — in game six. Of course they lost Game 1 at home, but Game 6 was not only on the road, it was in overtime. This year Washington winger Alex Ovechkin — the Great 8 — prevailed over the best player in the league, Sidney Crosby. In Game 6 Evgeny Kuznetsov scored the game winner off of Ovechkin’s assist. A two-on-one against Crosby. Pittsburgh goalie Matt Murray didn’t have a chance against that one. Wait … the Washington Capitals made it past the second round? What? Then it was on to Tampa Bay to face the Lightning. Yes, they started this one on the road, winning the first two games! 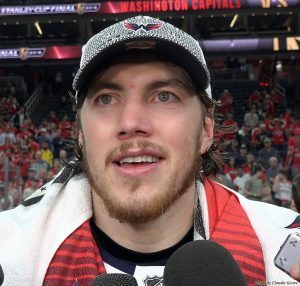 Then the series came back to the Capital One Arena and yep, the Caps lost those two games and then Game 5 in Tampa. Let’s face it, winning two in a row at this stage of the playoffs, with the home record Washington had, was … unlikely, to put it nicely. But something happened and Braden Holtby, who (we were told) was not up to playing in the Stanley Cup Playoffs, notched two shut outs. Not to diminish Holtby’s contribution. There was a point about five minutes into the third period when Holtby made five saves in 23 seconds. That was one third of the Caps’ shots on goal in that period. Ovi had that step in Game 2 and from then on this team was not going to be denied. Not that it was easy for the Capitals. Sure, it was their shortest series of the playoffs, but the Vegas Golden Knights didn’t get to the Final on pure luck and poor play in the Western Conference. Marc-Andre Fleury made some spectacular saves, but Ovi and Kuznetsov made some spectacular goals in Game 3. Then they skated all over the Knights in Game 4. But they needed four wins to take the Stanley Cup and Game 5 turned out to be one of the most exciting in Stanley Cup Final history. Well, it may not be an excuse but it was a factor. Viewers could see it. The Knights couldn’t play defense or score when it looked like a sure thing and Fleury looked worn down in that third period. He was making spectacular saves trying to fill the gap by the errant Vegas defense. That’s probably why in Game 5, Vegas gave the Capitals the game of their lives. When Lars Eller scored the game-winning goal with just under eight minutes to play, the Washington faithful could see the Stanley Cup coming. No kidding. If nothing else, Vegas has the best pre-game and intermission shows anywhere. It’s Las Vegas after all. There were show girls lining the hockey rink. A Mediaeval castle with drummers all lit up when they played. Michael Buffer introducing the teams. And yeah, the Capitals and Golden Knights did rumble. In the end, the Washington Capitals came together as a team to win the Stanley Cup, finally in the team’s 44-year history. After decades of postseason disappointment the Caps fans are lining Constitution Ave as the team makes its way to the National Mall. The last time Washington had a championship team was 1993 when their team won the Super Bowl. Enjoy it Capitals fans. It’s a special moment.